The Ink Trap: Bellarific Friday at Stamping Bella!!! Bellarific Friday at Stamping Bella!!! Hey, all! It's Bellarific Friday at Stamping Bella and I'm sharing a card today! I was supposed to share this colored image last week, but a dental emergency rendered me useless. Actually, it wasn't all that bad, but I chipped a piece off my back molar Tuesday night when I attempted to chow down on a late night snack while I was making a card for a DT deadline. And what was this ferocious snack that took out my tooth? A fig newton. Yep, dangerous. Who knew? I wasn't alarmed, but the next morning while eating a humble bowl of soggy cereal, I chipped a larger piece off the same tooth. Oh, boy. Now this could be a problem. An appointment with my dentist the next day revealed that extracting the tooth was my only option. Freakin' fantastic, just what I was wanting to do that day. I have a high pain tolerance, but let me emphasize that pulling a tooth in this day and age is just as barbaric as pulling a tooth 200 years ago. There have not been any real advances in dental technology that make this process pleasant or easy. Thanks be to the heavens for Novocain! Things started off nice enough with some easy chit chat, but once the Novocain completed it's numbing dance around my mouth, all bets were off. Out comes this tool that looks pretty much like a pair of fancy pliers or a clamp and might have been left over from Dr. Yankum's tangle with his car engine earlier in the day. By the way, his name has been changed, not to protect his identity, but to more accurately describe his dental excavating technique. Here's where it gets high tech...clampy plier thingy gets tightly placed on my tooth and Dr. Yankum begins to pull with all his strength. After a solid 15 - 20 minutes of pulling alternating with wiggling of the loyal tooth that refused to leave my side, I actually thought that the next step would lead to Dr. Yankum firmly planting his sneakered foot on my face in order to gain more leverage. Fortunately, it did not come to that and an audible crack signaled that we were close to the finale of our wild molar adventure together. Five more minutes of digging out a stray root that was left behind and we were finished. Sweet Mother of Pearl!!! My favorite part? After our tooth ripping rendezvous, Dr. Yankum says..."You have long, skinny roots". With a mouthful of cotton gauze, I reply..."Awe shucks, Doc. I bet you say that to all the girls". You are not here to listen to my dental woes, but I thank you anyway. By the way, the damn Tooth Fairy didn't even stop by my house. I will be sending her a strongly worded email. 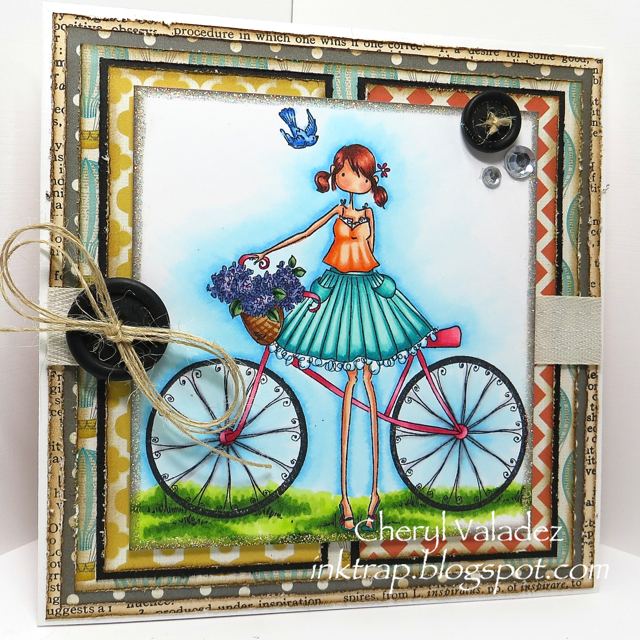 My card today features Uptown Girl, Flora the Cyclist. I bet Flora has beautiful teeth. Actually, Flora has no mouth...smart girl. Anyway, she is a beauty and an absolute joy to color. You can find her in the Stamping Bella Shop along with TONS of other ridiculously awesome stamps. This week's challenge was to use the sketch provided and if you know anything about me, you know that I am missing a tooth and that I adore a sketch! They are the best! Get your buns to the Stamping Bella Blog and see what this week's challenge is all about and be sure to play along! Okay, I best be scooting'! Until next time, stay crafty! Your card is BEAUTIFUL Cheryl!!! Gorgeous card Cheryl - very bright and perfect for spring! Your shading as always is awesome! I love how you did her top and the shading around with the blues. I struggle with grass if it's not already part of the image - you did a great job. I will have to refer back to your grass :). Certainly your tooth trauma did not hinder your stamping ability it's a beautiful card! Great card Cheryl! Your coloring as always is fabulous! Your story about the dentist made me have tears running down my legs! LOL! I am so sorry you had to have the tooth pulled and hope that you are not in pain. Out to Lunch by Art Impressions! Bellerific Friday at Stamping Bella! Cupcake BFFs by Art Impressions! Under My Umbrella from Art Impressions! 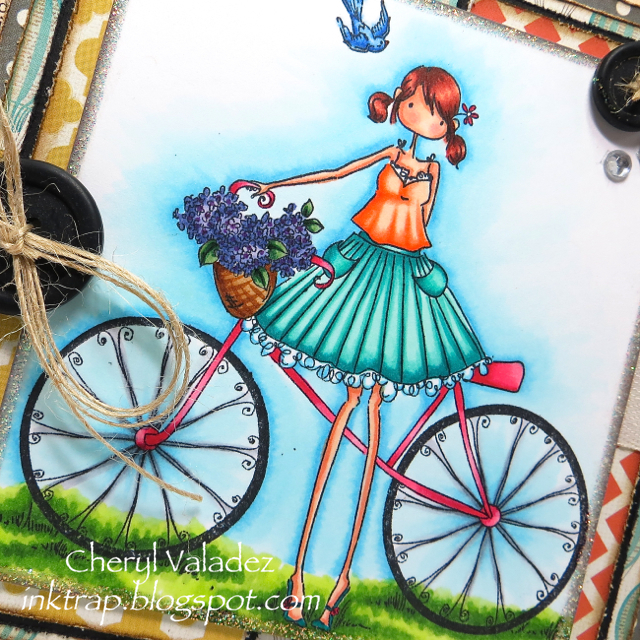 SCACD Elements Rubber Stamp Blog Hop! Art Impressions BFF Blog Hop! Selma and Gladys from Art Impressions!